Covers the basic knowledge of the regulation of biosynthesis of various amino acids in plants and the application of this knowledge to the discovery of novel inhibitors of amino acid biosynthesis and for enhancing the nutritional value of plant products. Provides an exhaustive list of pathway inhibitors. 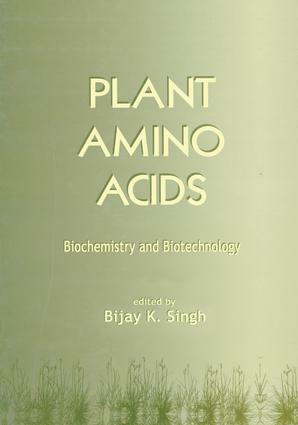 ". . .a thorough treatise of an important field of plant biochemistry, written in a scholarly way, without thousands of full references. . .that can serve as a sourcebook for all interested members of the scientific community"
". . .the authors of each chapter have given precise and useful information. . .which renders this book immensely valuable"
". . .absolutely essential for scientists working on amino acids"
Nitrogen metabolism in higher plants; the enzymes of glutamine, glutamate, asparagine and aspartate metabolism; seine and glycine metabolism in higher plants; the shikmate pathway; the biosynthesis of tryptophan, tyrosine and phenyalanine from chorismate; lysine, threonine and methionine biosynthesis; biosynthesis of valine, leucine, and isoleucine; regulation of proline and arginine biosynthesis in plants; biosynthesis of cysteine; histine biosynthesis; amino acid transport; role of amino acides in abiotic satress resistance; inhibitors of tryptophan, phenylalanine and tyrosine biosynthesis as herbicides; inhibotors of histidine biosynthesis; inhibitors of glutamine biosynthesis; herbicide-resistant crops to inhibitors of amino acid biosynthesis; enhancing the content of the essential amnio acids lysine and thereonine in plants; methionine enhancement in plants; glucosinolates; biosynthesis of cyanogenic glycosides, cyanolipids, and related compounds.